Gera will host the XVIII. European AN-2 Meeting on 11.-14 August 2016. Sympathizers of the largest single engine biplane from all over Europe will meet here. 23 of these aeronautical prehistoric planes made it to Gera in 2009, we are sure that this number can be beaten this year! We want to offer the ultimate AN-2 experience to all our visitors, sharing the fulminant roaring feeling of a 1000 HP strong radial engine – both as a spectator from the ground as well as a passenger on one of the short flights. 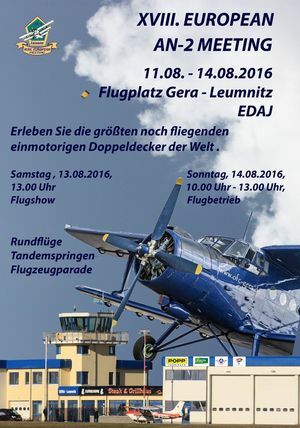 Don’t miss the exiting days when the world‘s largest biplanes (precisely: one and a half) will be guests in Gera! Planes from all over Europe are expected and can be visited four days long - on the ground and in the air. Dear friends and sympethizers of this year’s AN-2 Meeting, the organization of the event is on its way. We will regularly publish updates to the programme of the event. Thank you for your understanding that we will first provide all participating pilots and attendants with information and details. Visitor information will be published in time as soon as the organization will be finished. The registration form for all AN-2 Pilots, passengers and planes can be found here.